View cart “Peppa Pig Placemat” has been added to your cart. 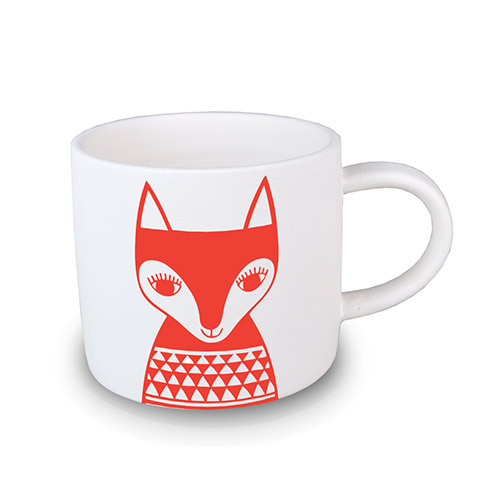 Designed by Jane Foster, this fun and quirky Red Fox mug is full of personality and Scandinavian charm! Superbly crafted from super white porcelain, the shape of the mug was designed in collaboration with master potter Keith Brymer Jones, to ensure that it fitted the ethos of Jane Foster’s original design perfectly. Vibrant and stylish, this mug won’t fail to brighten up anyone’s daily routine! A firm favourite with both adults and children, Jane Foster’s work is bold, simple and happy. Her designs originate as screen prints made at her studio in Devon. Jane loves bright colours and is inspired by Scandinavian and 60s design.